Was the Three-Tiered Universe Merely Phenomenological? | J.W. Wartick -"Always Have a Reason"
Was the Three-Tiered Universe Merely Phenomenological? There are many passages throughout the Bible which appear to show that the authors believed in a three-tiered universe in which there were the heavens, the earth, and the underworld/waters. Some Christians argue that these descriptions were merely phenomenological: that is, the authors were writing as observers rather than attempting to report anything about the actual world. It is like when we say the sun rises, we aren’t actually intending to say the sun is orbiting the Earth, but rather just reporting something we experience: our perspective shows the sun rising. Greenwood’s argument seems to me to be quite convincing. If we want to hold that the Bible’s cosmology is phenomenological, we should have some textual evidence that demonstrates a different perspective was in mind. We don’t. Thus, when an author in the Bible speaks of the skies being “hard” (Job 37:18, for example), this reflects an ancient cosmology. None of this does anything to undermine the authority or inerrancy of the Bible. Inerrancy, I believe, should properly be understood as meaning “The Bible is true in whatever it teaches.” (See my article on the term “inerrancy” and its usage.) The authors aren’t trying to teach us about cosmology, that’s just a background belief. They must describe the heavens somehow, and they used the understanding they had of the cosmos. What do you think? Can we reduce the language of the Bible to being phenomenological? What reasons might we have for doing so? How might we best understand the Bible’s cosmology in light of other Ancient Near Eastern cosmology, and how could that help us understand what the Bible teaches? 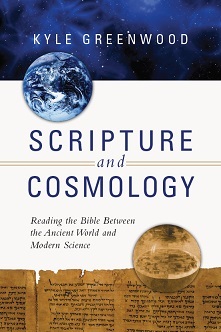 Kyle Greenwood, Scripture and Cosmology (Downers Grove, IL: InterVarsity, 2015). « Really Recommended Posts 11/13/15- Homo Naledi, Dean Koontz, and more! I do agree that what the human authors believed is to be distinguished from what the divine author intended to teach. However I question whether your “what the Bible teaches is true” formula qualifies as a definition of inerrancy. It’s didactic magisterium, a more limited claim. On your view, faced with Mark 2:26 you can say that either Jesus or Mark made an error about the name of the High Priest but it doesn’t matter as Jesus/Mark weren’t teaching about history. I think that’s right but that’s why I don’t call myself an inerrantist. I believe there is an error here, and one that would be considered such by contemporary readers hence why Mathew and Luke cut it out. So the Chicago qualifications allowing for figures of speech or a degree of imprecision that was acceptable within the canons of ancient biography are irrelevant. It’s an error by any standard. But not a didactic error, the point of the teaching is that some rules have exceptions. Now if you agree, or even think that my take is permissible within your own formula (which is how I would sum up didactic magisterium), then perhaps you should reconsider your attachment to the term inerrancy. You could talk of didactic inerrancy rather than magisterium if you like but you need a qualifier. If on the other hand you insist that there is no error in Mark 2:26 (or any other passage) then you can call yourself an inerrantist, but your “what the Bible teaches is true” summary needs filling out. I’m not going to suggest that you are sticking to the term to stay in the evangelical club. I suspect you get more flak as a result of redefining inerrancy than simply setting aside the term. But why not just stick to your formula and drop the term inerrancy? It’s not in scripture, it’s misleading in most forms proposed, and it’s an empty box due to the loss of the autographs. Moreover the claim that the bible doesn’t err wouldn’t distinguish the bible from an accurate telephone directory. The claim that the bible can’t err is clearly what is meant but that’s infallibility not inerrancy, yet the term infallibility is now taken to indicate a weaker claim, similar to didactic magisterium. Just food for thought. We can see the ancient writers assumed the three tier cosmos was a physical reality through the explanation they had for how a three tier cosmos works, for example the pillars of the earth to hold the solid ground up over the watery abyss. The abyss itself cannot be phenomenological since like the pillars of the earth, no one had seen it, this vast underground sea was how they explained springs and artesian wells, also referred to as abysses. We also see it in the writer of Ecclesiastes hypothesising an unseen water cycle where rivers flow into the sea but the seas don’t fill up because the water flows back through the underground abyss to the fountains and springs the rivers flow from Eccl 1:7.